When discussing World War Two aeroplanes everyone has a favourite, but one aircraft attracts universal admiration and that is the de Havilland Mosquito. The Mosquito was unique in concept and design. In an age where aluminium stressed skin construction had been fully embraced by all nations serious about aircraft production, de Havilland built an aeroplane out of wood; an aeroplane that in its bomber configuration and with a crew of just two, could carry the same bomb load as a Flying Fortress and then depart the scene at such a speed that Luftwaffe fighters could not catch it. Most Mosquito restorers would agree that a Mosquito wing could be rebuilt as a fairly conventional, albeit exhaustive exercise. (A small spruce forest and a truck load of brass screws would help in the process.) The Mosquito fuselage however, is unique in the way that it was built, requiring two enormous and extremely complex moulds to be constructed before even starting work on the aircraft itself. It was always the hard nut to crack for this aeroplane and it seemed certain that no one person would ever contemplate this daunting task. Over the last six years however, one individual has done precisely that and the potential impact of achievable Mosquito fuselage rebuilds is set to have a staggering effect on the world-wide Mosquito population. When Glyn Powell of Auckland, New Zealand first decided that one way or the another he was going to pursue a flyable Mosquito, he knew precisely what he was taking on. He travelled to places around the world where Mosquitos were flying, on display, stored or under restoration, including all the Australasian survivors. He proceeded to gather all the metal parts that he could locate in this region as well as manuals, books, and tech.notes and most importantly over 8,000 microfilm drawings. After thousands of hours of full-time input, Glyn has now completed the all-important left and right moulds. These moulds are adaptable, in as much as bomber, fighter and photo reconnaissance models can all be produced. 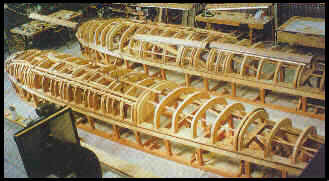 Glyn has since commenced construction of the first fuselage. This will be a non-flier to test drive the jigs and once completed the first airworthy fuselage can proceed to be built up. There is no question that this a most ambitious project. However the biggest stumbling block, in fact the biggest single undertaking in the entire project, has now been overcome. This then leads the way clear for the restoration own NZ2308 and potentially many other 'disembodied' Mosquitos all over the world. Since the end of World War Two the future prospects for the Mosquito as a type have progressively declined, as have the number of machines capable of being flown safely. Now after 50 years that inevitable decline can be turned around with the prospect of replacement wooden fuselages being made viable. The Mosquito will have the chance to soar again. Glyn Powell's efforts, through his company 'Mosquito Aircraft Restoration Ltd' may well prove to be the salvation of the breed.